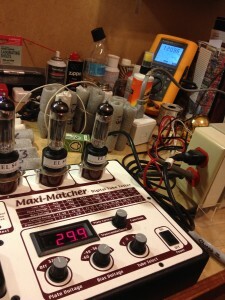 Vacuum Tubes are the heart of any good tube amplifier. 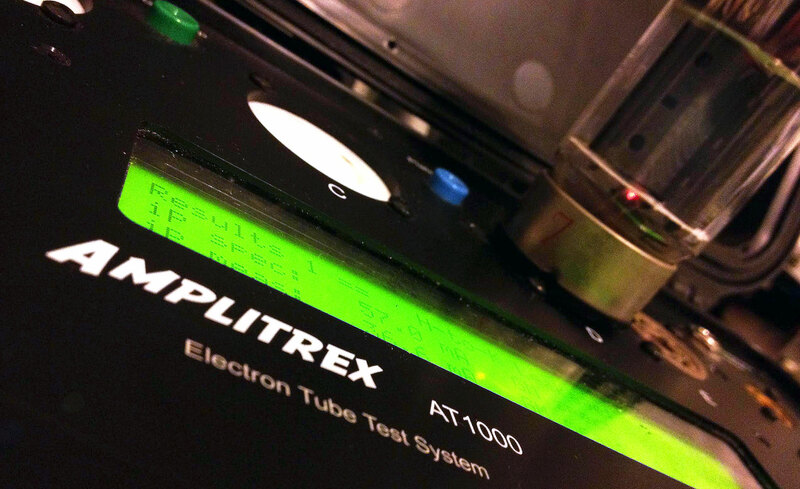 This is why Desert Amplifier uses the Amplitrex AT1000 Tube Analyzer to test every tube that comes in. This service is included in the basic estimate. The Amplitrex accurately tests hundred of popular tubes, as well as allows us to create our own custom tube tests, with regulated power supplies producing actual operating voltages up to 500 Volts. The Test Parameters include Emission, Transconductance (GM), Gas, and Heater to Cathode Leakage. In addition we can test for Microphonics, and Curve Trace plotting when in Computer Control Mode using the dedicated Computer. The Amplitrex AT1000 allows us to weed through tubes and pick out the good from the bad, as well as select matched and balanced tubes for Phase Inverters. In addition because of the ability to test at actual operating voltages the tester also matching power tubes with incredible accuracy and reliability. To cover all the Ampeg V4 series Amplifiers we had a custom Test Jig and preset made for the 6K11 tube allowing us to test all 3 sides. For more information on the Amplitrex AT1000 check out (amplitrex’s website). ge and ultimately so do your test results. Then we come to calibration, the tester is only as good as the calibration… (Amplitrex Calibration) Not to pile on but most old tube tester use an analog dial while a good number of the dials are of quality it’s ultimately left up to a person to interpret the test results.. So it’s only as truthful as the person reading the dial. The Amplitrex displays the test results on an all digital display, or on the computer on a test result sheet. These are some of the reasons we picked the Amplitrex AT1000. We take pride in our work and having the proper tool for the job goes a long way to getting the results we strive for. We don’t want your amplifier to just work… We want your amplifier to sound it’s best, for as long as possible. In addition to the Ampltrex we also have a Maxi Matcher in the shop. 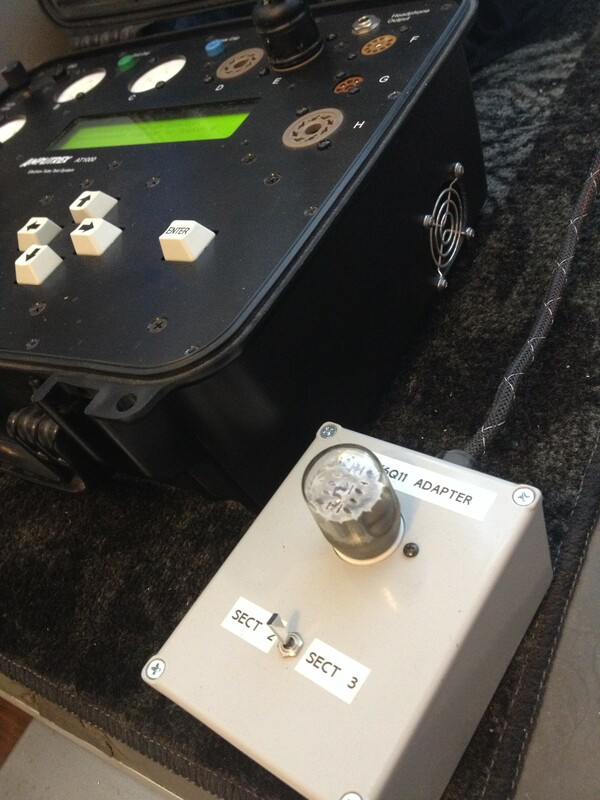 This piece of equipment is used to match up to 4 Power Tubes with preselected Bias points and Plate Voltage selectable between 325V and 400V. 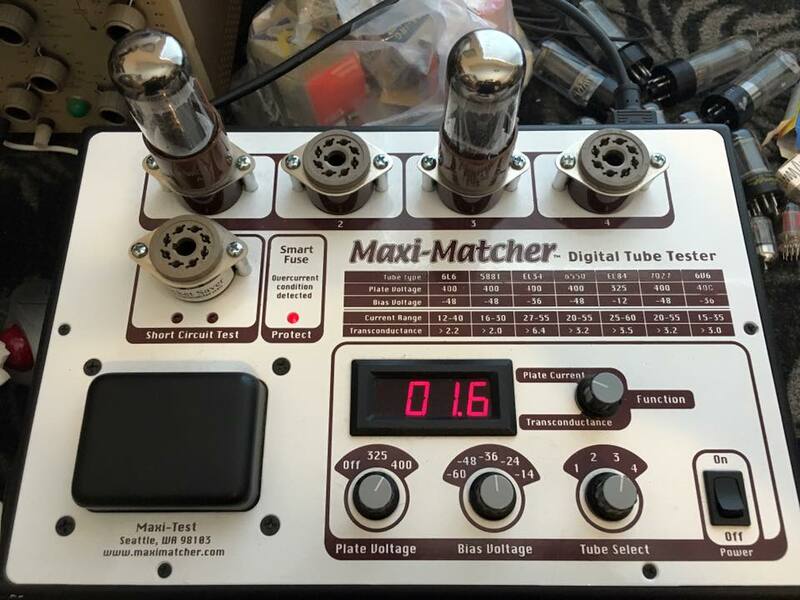 Because of this voltage limitation it’s use is limited largely to 6V6, 6L6, and El84 type tubes, though we do have the full assortment of test adaptors for testing other tube types on the Maxi Matcher. We purchased the MaxiMatcher, because for decades it was the industry standard for tube supply houses, and consistently we would receive tubes that were poorly matched and performed terribly in amplifiers under actual operating voltages, so owning this tester gave us a way of holding the suppliers accountable for poorly matched tubes. If the tube isn’t tested/matched at the voltages in which it operates the test is meaningless. At least the Maximatcher has a digital read out, however it’s power supply is not regulated which caused a lot of the inaccurate test results mentioned above. To solve this we had a CVT (constant voltage transformer) modified to power the tester. The CVT makes sure that the tester maintains a secondary operating voltage within 0.025Volts at all times. Without the CVT the voltage could fluctuate as much as 40Volts depending on what the Main Powers Fluctuation of the Primary Voltage would be. Something that the Maximatcher does due very well is isolate tubes that have voltage issues; Shorts, and excessive current draw. It’s also good for matching tubes that have been tested good on the Amplitrex AT1000 assuring they are free of Gas, Microphonics, and leakage. After the tube is know to be good and the test voltages are within the correct range of final operation this is a very useful piece of equipment.